Add a touch of refined beach freshness to your table with Boca Napkins. Part of our Palm Beach Chic collection, the Boca napkin is a perfect blend of cool beach and elegance. With an organic, cotton-like texture and a delicate threaded white trim, the all-white Boca napkin adds a crisp and cool touch to any table. 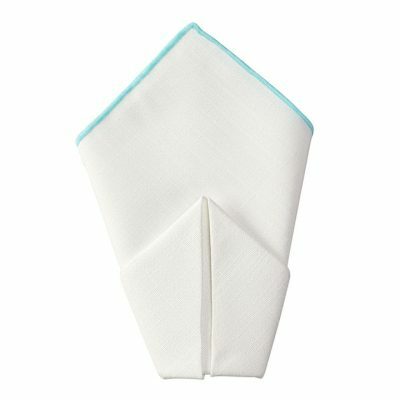 Perfect for any poolside or coastline event, the Boca Napkin is a refreshing touch to any event d?cor. 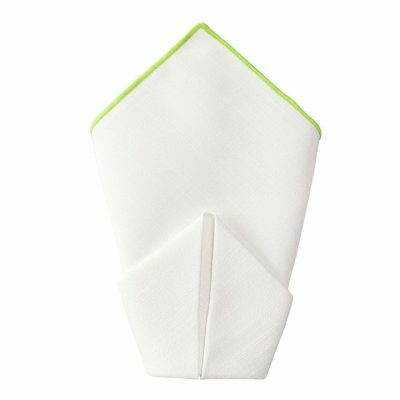 Add a touch of freshness to your table with Boca Napkins with aloe green trim. 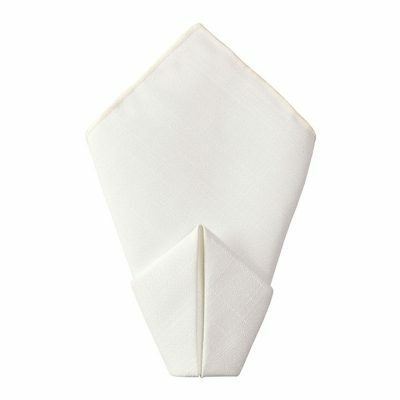 Part of our Palm Beach Chic collection, the Boca napkin is a perfect blend of cool beach and elegance. With an organic, cotton-like texture, the all-white Boca napkin with a green aloe thread trim will give any table an instant perk. The delicate threaded trim in fresh green pairs perfectly with any linen in the Palm Beach Chic collection. Add a touch of freshness to your table with Boca Napkins with saltwater blue trim. Part of our Palm Beach Chic collection, the Boca napkin is a perfect blend of cool beach and elegance. With an organic, cotton-like texture, the all-white Boca napkin with a watery blue thread trim will give any table an instant beach-cool feel. The delicate threaded trim in a soft, watery blue pairs perfectly with any linen in the Palm Beach Chic collection. 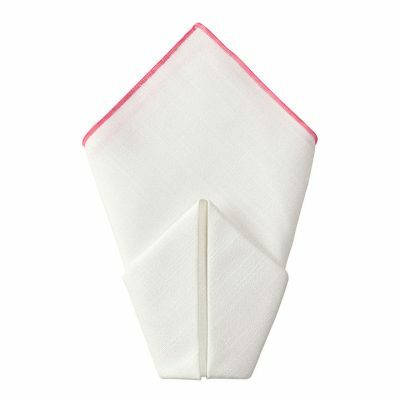 Add a touch of freshness to your table with Boca Napkins with watermelon trim. Part of our Palm Beach Chic collection, the Boca napkin is a perfect blend of cool beach and elegance. With an organic, cotton-like texture, the all-white Boca napkin with a pink watermelon trim will give any table an instant perk. The delicate threaded trim in bright pink watermelon pairs perfectly with any linen in the Palm Beach Chic collection. Aloe Cabana, part of the Palm Beach Chic linen collection, is equally elegant, playful and modern. 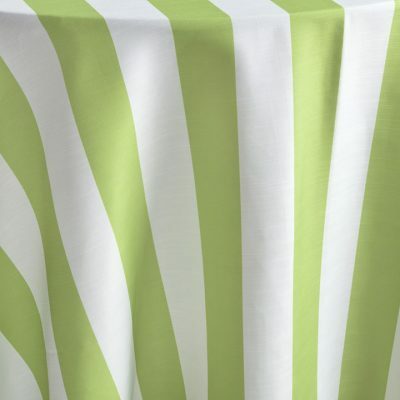 Aloe Cabana?s green and white stripe combination is a perfect choice for a cool and water-side look. Whether?poolside or on a shady patio, the cooling effect of pale, stripes lend a sophisticated air to any setting. Featuring a vibrant green, Aloe Cay is the epitome of sophistication and exotic?resort ambiance, no matter what the location. 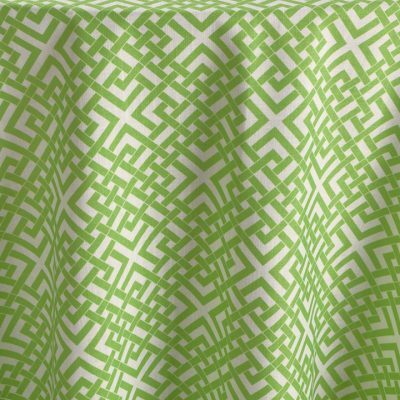 The elegant and cheerful green pattern is light and bright, making this linen a statement choice. It?s a dramatic expression of Palm Beach Chic. A lush palm leaf pattern can turn any special occasion into a tropical paradise.? 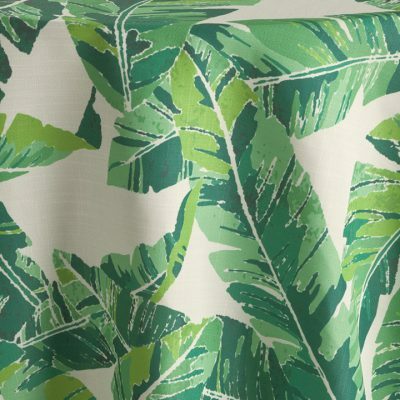 This banana leaf linen, part of the Palm Beach Chic Collection, is a sophisticated pattern with a Beverly Hills past. Breakers Palm is an outstanding choice to add drama and delight; it’s perfectly suited to bring new dimension to any event. Keep the accessories simple and let the linen itself speak! Bright hibiscus pink and aloe green with a touch of whimsy, the Catalina is a bold and vibrant print.? We think it’s a chic way to celebrate the colors of spring and summer. This is an example of Palm Beach Chic that is as appropriate for a glamorous soiree as it is for a stylishly casual garden brunch. 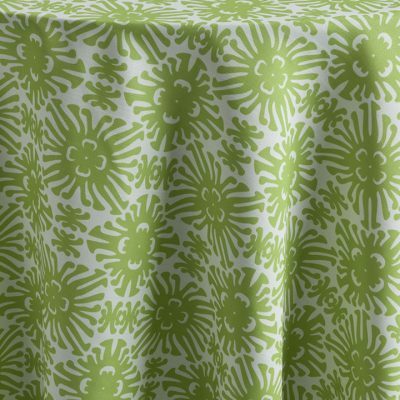 Perhaps the most playful pattern and color combination in the Palm Beach Chic linen collection, Isla Vista is a delightfully fresh and fun linen that can’t help but be a standout at any event. The color and the pattern evoke memories palm trees and bright pink hibiscuses sifting in the breeze. 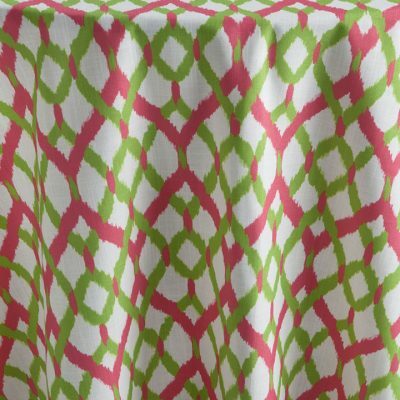 ?This jubilant beach-side pattern will turn heads at any stylish affair. 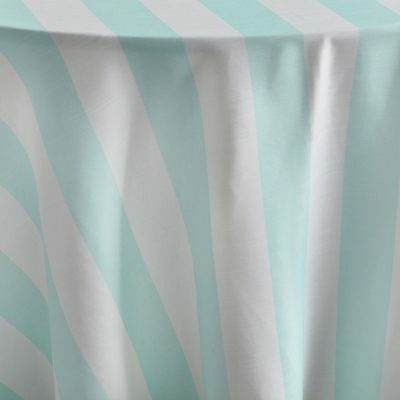 Much more subdued than most of the colorways of the new Palm Beach Chic linen collection, Saltwater Cabana Stripe is a decidedly cool and bright choice. Whether?poolside or on a shady patio, the cooling effect of pale, watery stripes lends a sophisticated air to any setting. No matter how you choose to accessorize this stylish linen, it will testify to good taste and good times!? 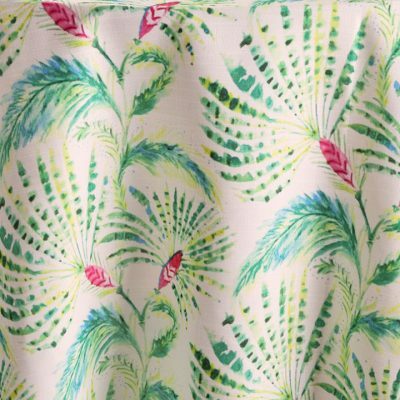 A kaleidoscopic tropical motif, Sanibel is a statement making print in the Palm Beach Chic Collection. The lively pattern features delicate tracery in shades of assorted island greens with vibrant pops of cerise.? 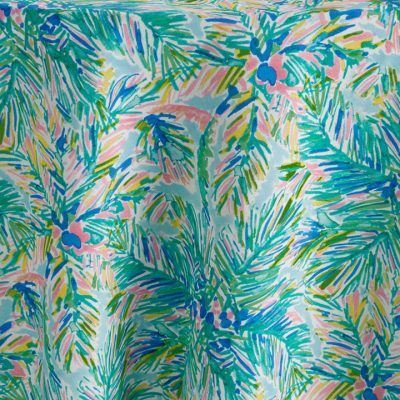 This palm patterned print is powerful enough to be the only pattern in the room or mix in other patterns from the collection to create that iconic preppy Palm Beach look.